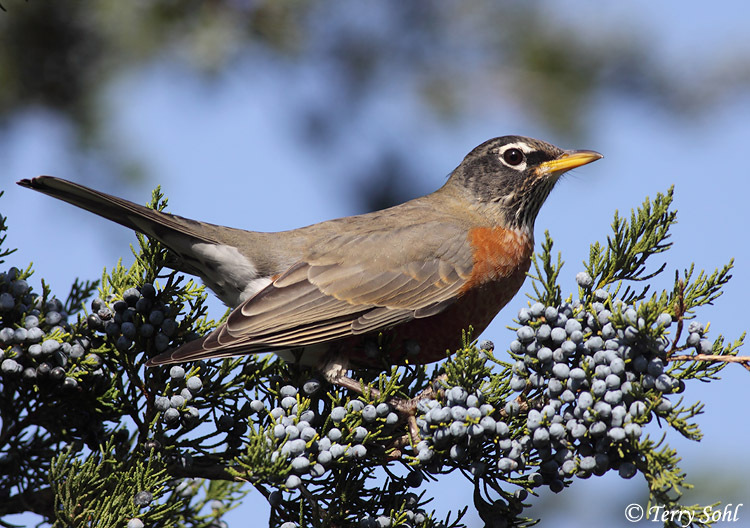 ID Keys: Distinctive, with brick red chest, dark upperparts, white around eyes, yellow bill. 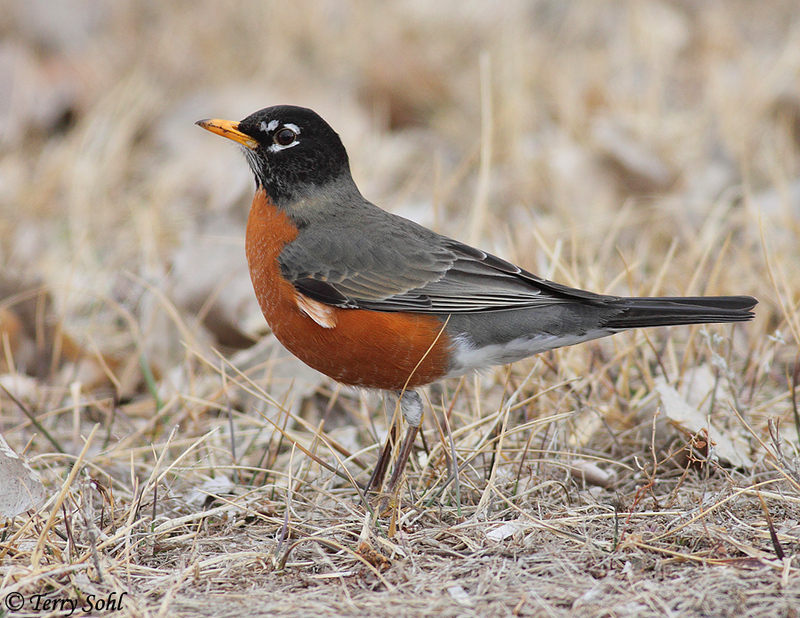 The American Robin is a very common and familiar bird across the state. 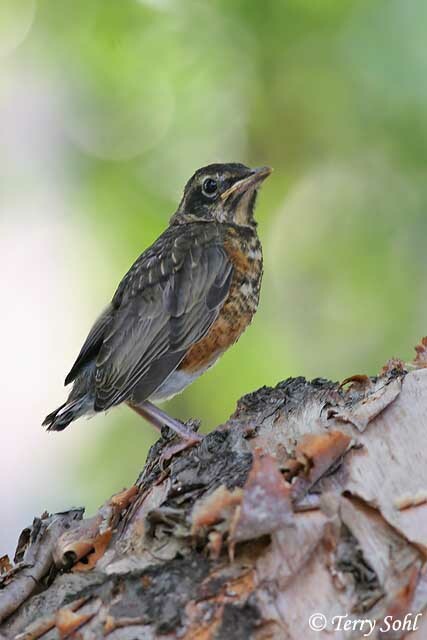 Well adapted to living with humans, they will readily nest and forage near dwellings. 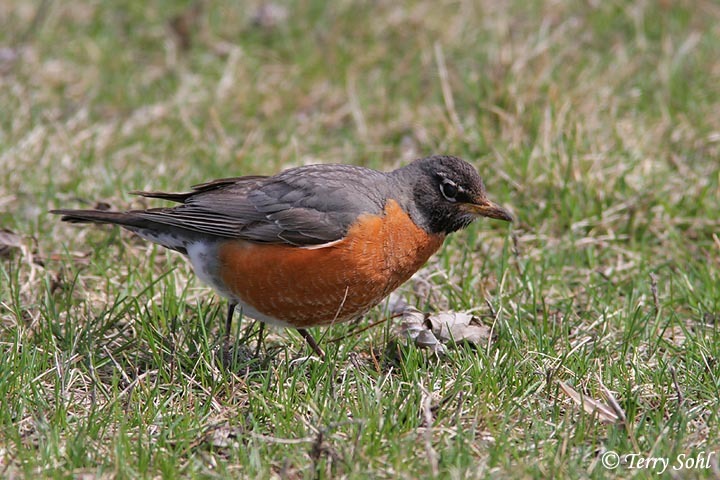 They are often seen in suburban settings, running across lawns as they forage. 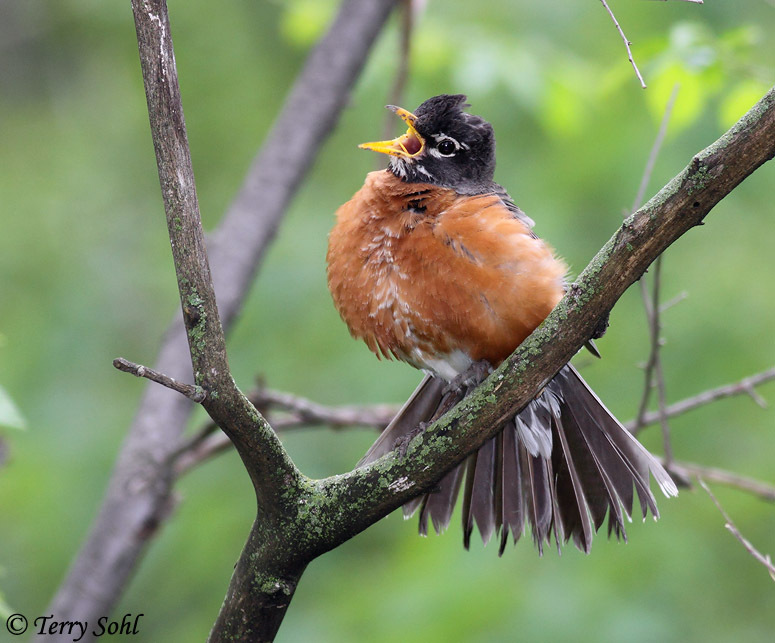 Their song is also one of the best known bird songs in much of North America, a warbling song that is often given very early in the morning. 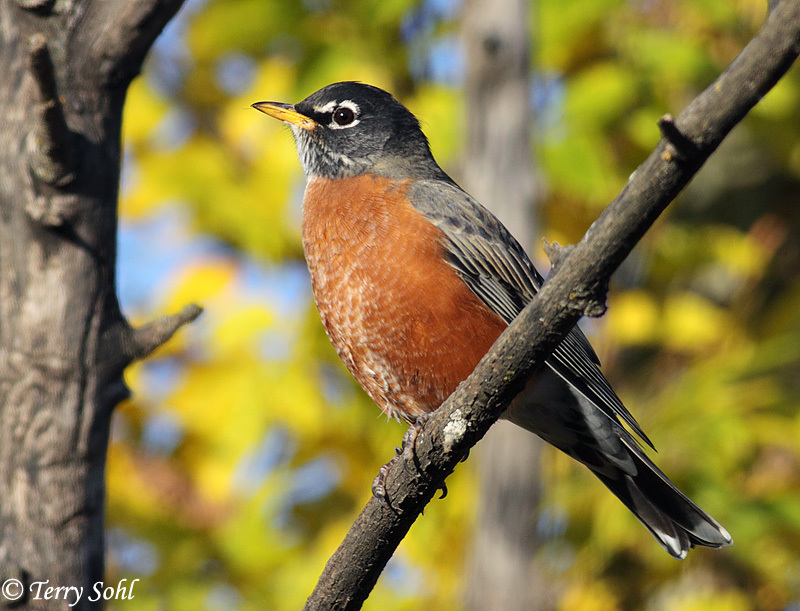 Habitat: Residential areas, parks, farmland, forests. 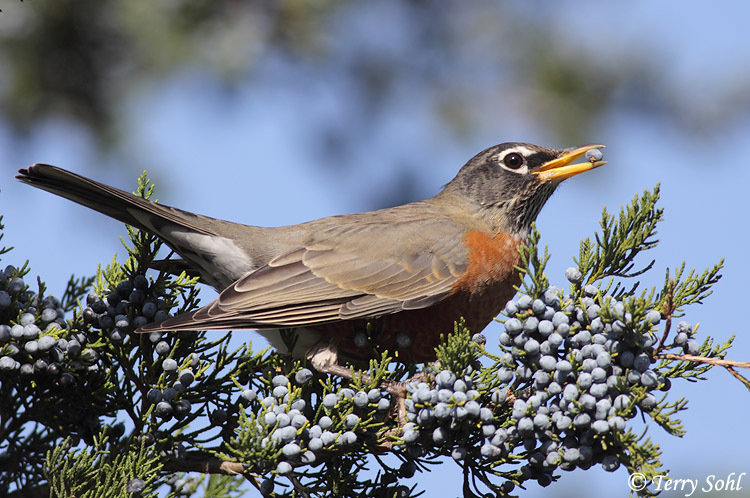 Often near berry sources when wintering. 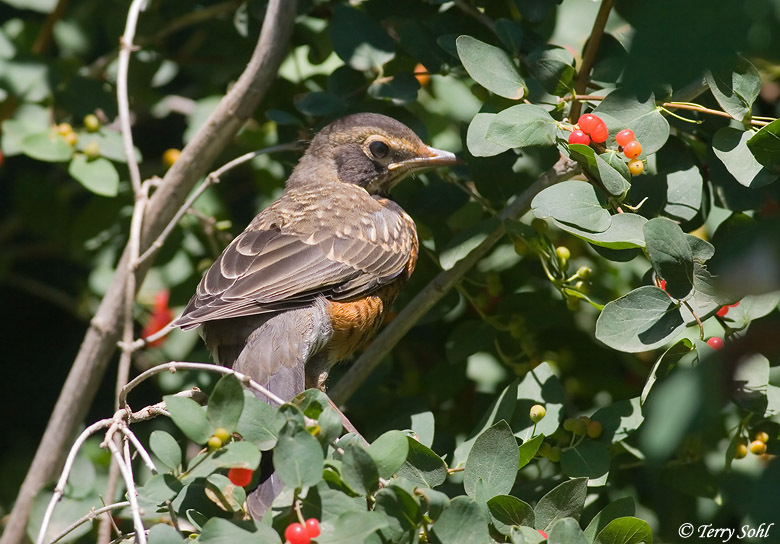 Diet: Mostly fruit and berries, insects, and earthworms. Behavior: Primarily forages on the ground, where earthworms are a favorite item. 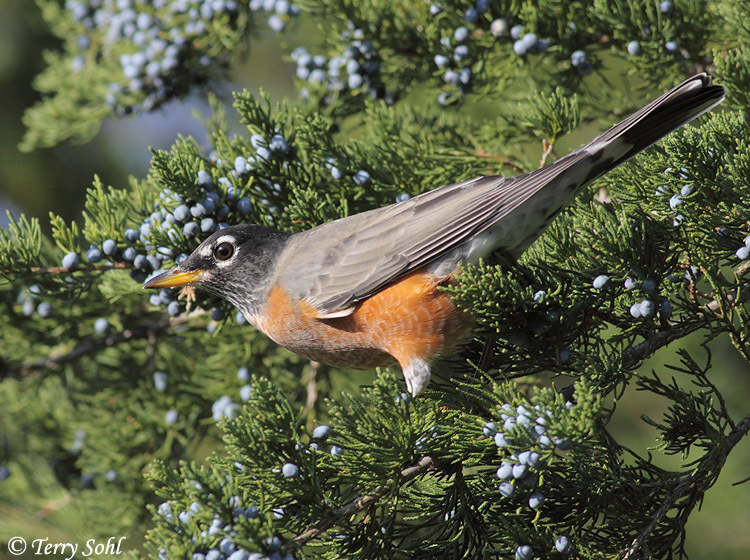 Will also forage in trees and shrubs for berries. 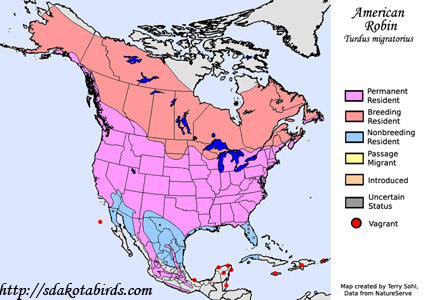 During the winter months, they tend to become more concentrated and localized, especially in the northern part of their range. Nesting: Late April through July. 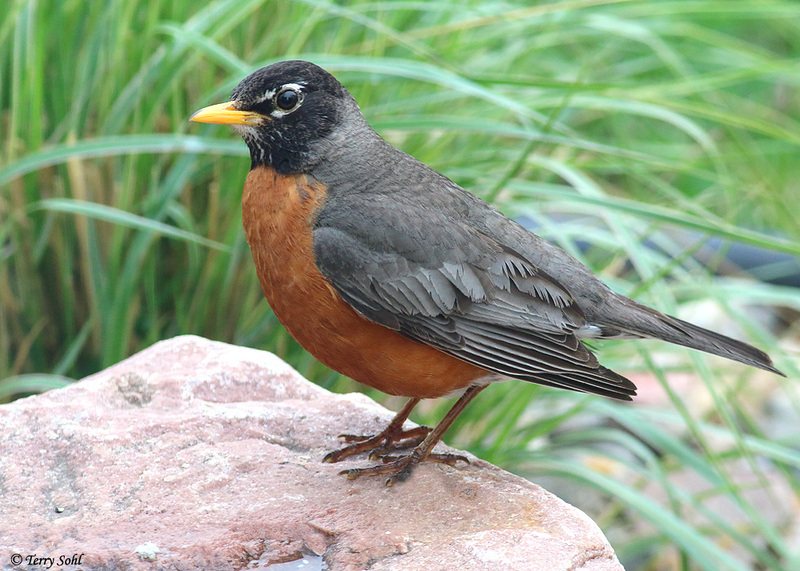 The nest of an American Robin is a cup of grasses, sticks, and weeds, with mud used to cement the nest together. 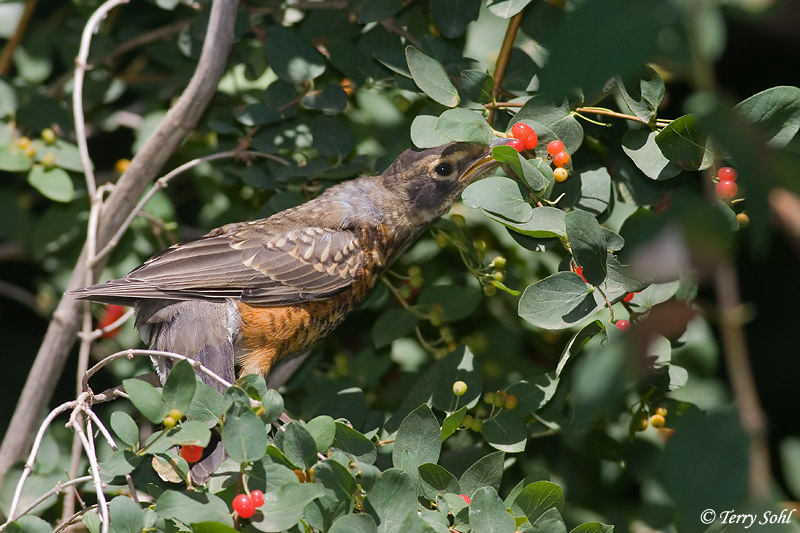 The female usually lays 3 to 5 eggs, and the female alone incubates them. 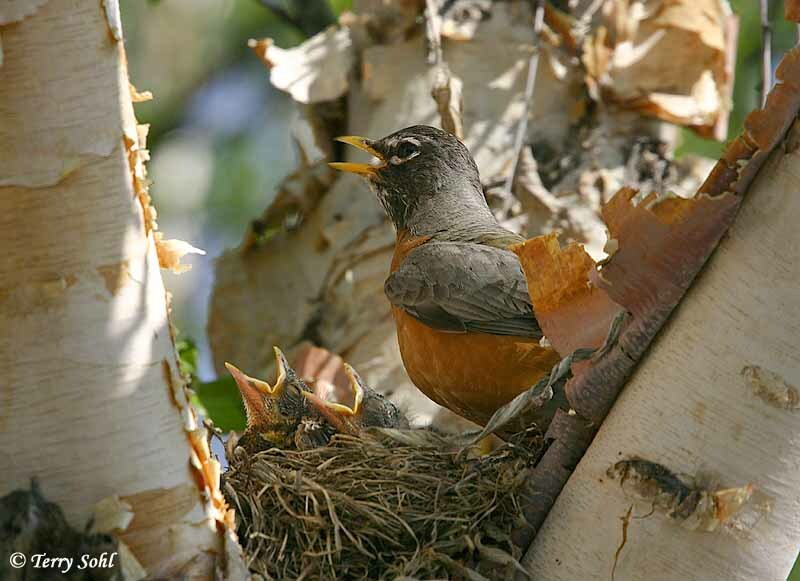 When the eggs hatch, both parents help to feed the young. 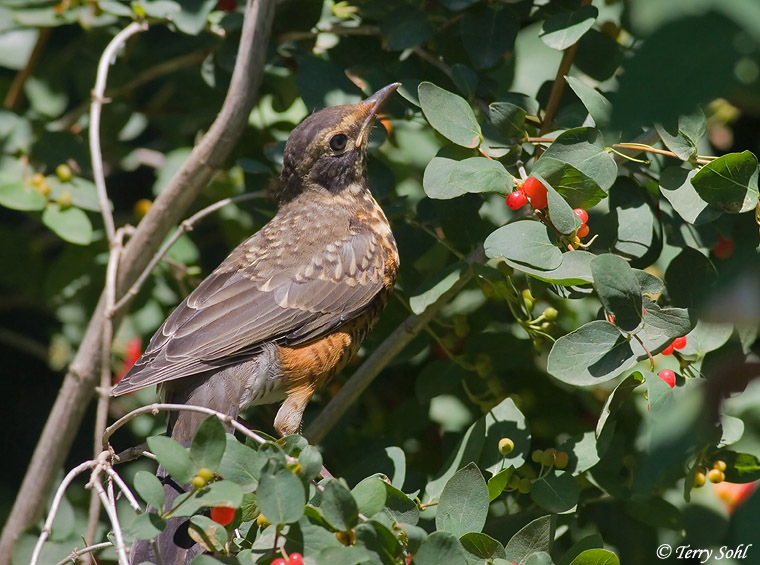 The young fledge after 2 weeks or more. 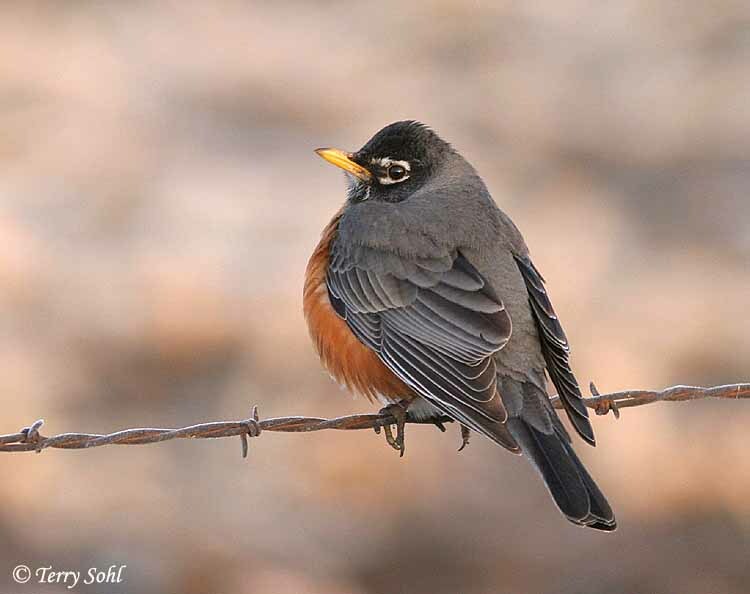 Migration: Migratory, but gathers in large flocks and can be found in scattered locations in the winter. Wide variation in numbers from winter to winter and from location to location. Feeders: Breadcrumbs. 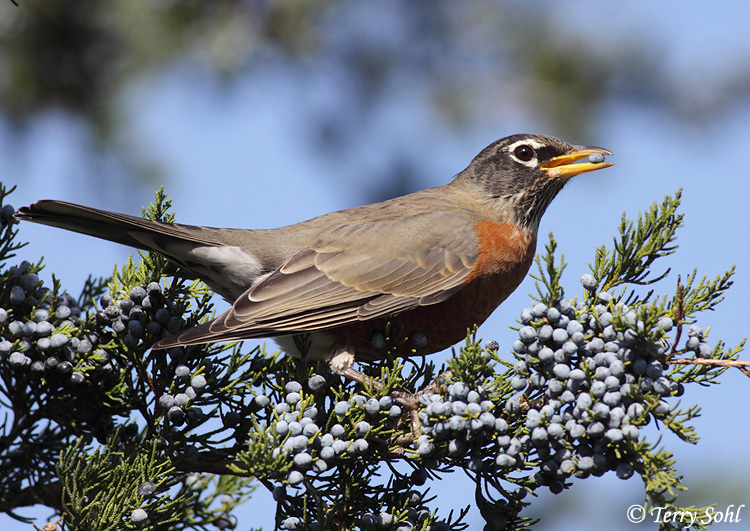 Note that I personally have had Robins feed on shelled sunflower kernels that had fallen on the ground below a hanging feeder, and I've also had them occasionally feed on fallen (shelled) peanuts. 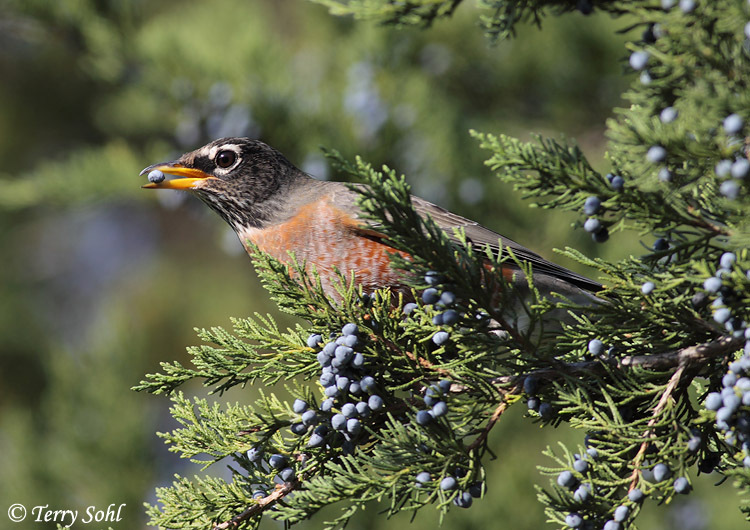 They'll feed on suet as well if they can access it, particularly in colder weather. Birdhouses: Will use nesting shelves. 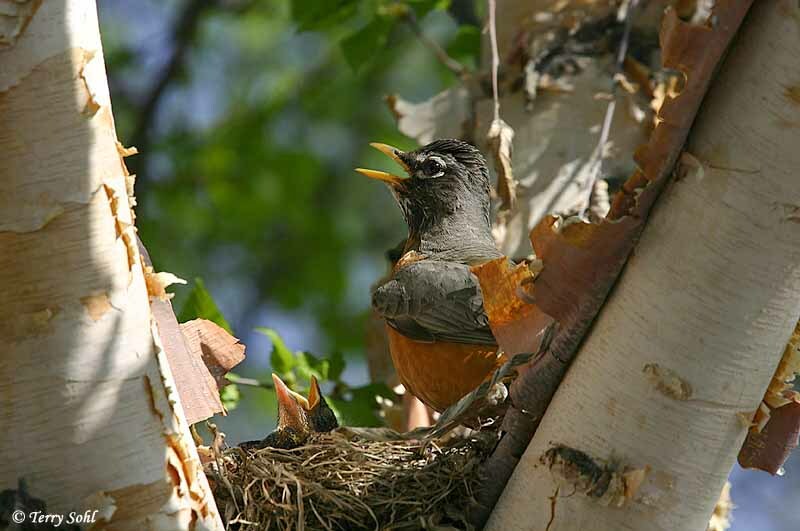 Also will nest on semi-protected areas of buildings. 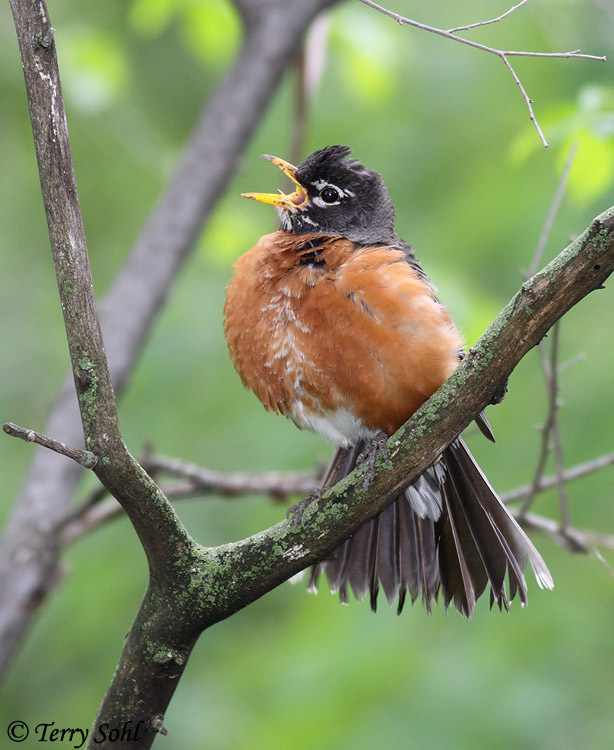 Conservation Status: Numbers are stable, they are found across a very wide geographic area, and they are very common in many parts of their range. 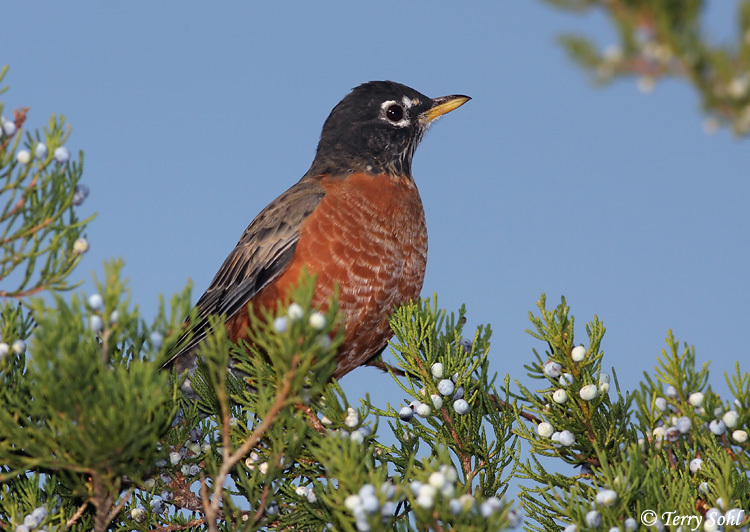 The IUCN lists the American Robin as a species of "Least Concern". 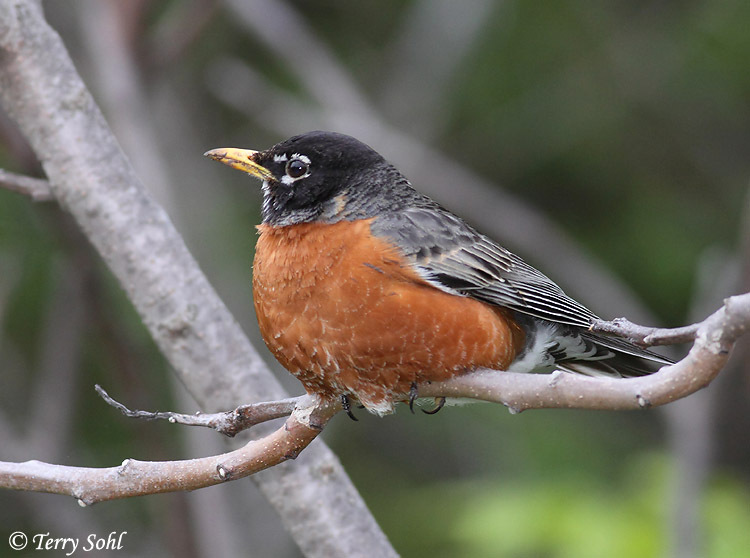 Additional Photos: Click on the image chips or text links below for additional, higher-resolution American Robin photos. 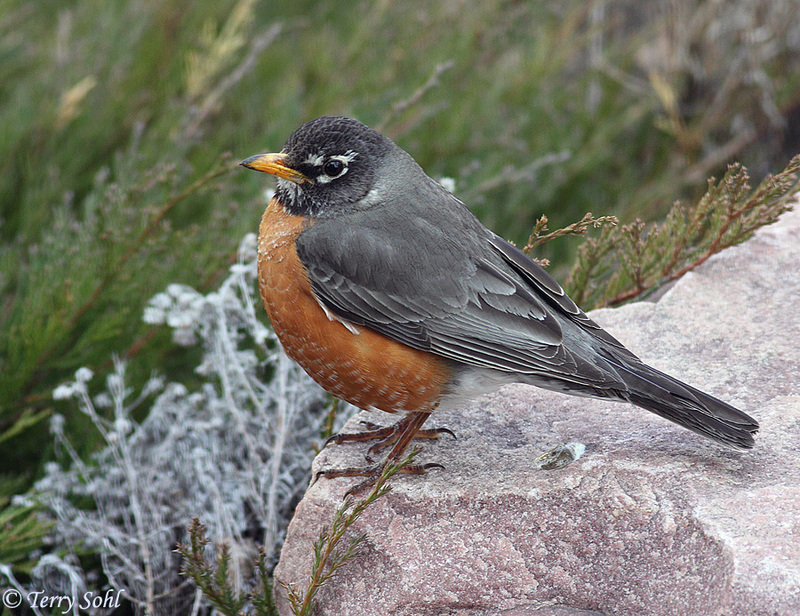 South Dakota Status: Common summer breeding resident. 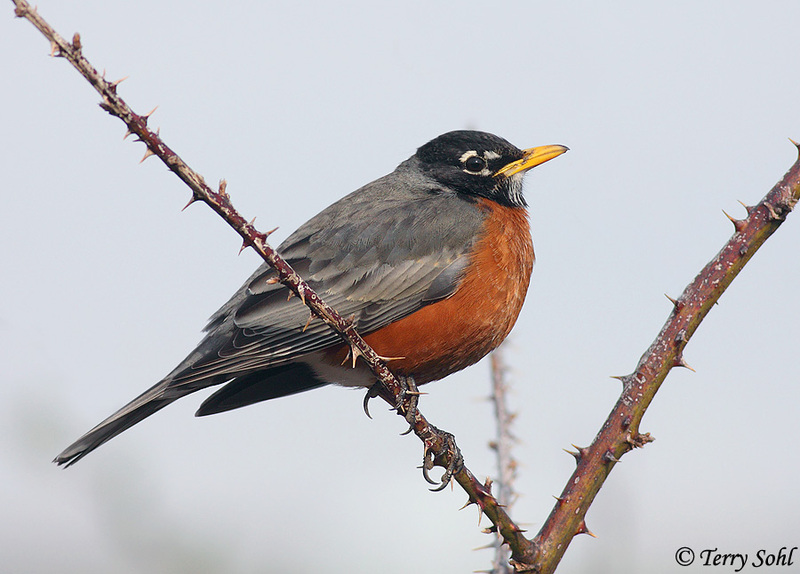 Numbers can vary greatly from year-to-year and between locations in the winter, from rare to locally common.